The Axedale Cemetery is situated on 9 acres, on the corner of McIvor Highway and Cemetery Road in a bush setting, surrounded by gum trees. The first unconfirmed burial was George Bywaters in 1865. The Axedale Cemetery, unusually, is actually, two separate cemeteries side by side. There is the Protestant or public cemetery and alongside it the Roman Catholic Cemetery. This is a private cemetery administered by the Catholic Church of Bendigo. The Catholic cemetery is surrounded by an eye catching bluestone wall. HOW BUSH FIRES ARE CAUSED. What is evidently a most despicable and malicious act was perpetrated at Axedale on Wednesday evening, the victim being Mr. N. Ingham, the well-known quarry proprietor and hotel keeper of that place. On Tuesday after noon an elderly man named Charles Seward, a laborer, arrived by train in Axedale, having been engaged at the Government labor bureau in Melbourne, by Mr. P. J. Cooney, the teacher at the Campaspe East State School, to work for him for 8s per week. On Tuesday evening he camped on the river bank under the bridge at Axedale, and on Wednesday he did some odd jobs for Mr. Ingham, who, however, was dissatisfied with the manner in which the man performed his work. They had a settlement, and Mr. Ingham told the fellow to move on. Seward asked for a glass of beer, but the request was refused. The man left the hotel muttering vengeance against the landlord. He took his swag and tramped off along the road to Toolleen. A young man, named Johnson, a woodcarter in the employ of Mr. Minter, was driving a horse and load of wood into Axedale, when he discovered that he had lost a couple of wedges. He walked back along the road and suddenly came on Seward, whom he alleges he saw set fire to a fence in three different places. As soon as Seward saw that he was discovered,he remarked to Johnson, ” You saw me lighting my pipe, didn’t you?” Johnson replied that that excuse was ” too thin, ” as he had seen the man deliberately fire the fence, which belongs to Mr. Ingham. Seward remarked that if Johnson said a word about the matter he would blow his brain out. He then walked off along the road towards Toolleen. The alarm was raised, and several persons attracted by the smoke hurried to the spot, and by their united efforts subdued the flames, but not before nearly half a mile of fencing and a quantity of grass had been destroyed. Mounted constable Haydon, who is in charge of the police station at Axedale, was away on duty at the Wild Duck Creek during the day, and on his return home in the evening the matter was reported to him by Mr. Ingham. The constable at once set off in chase of the offender, and nearing Toolleen, which is about 15 miles distant from Axedale, he noticed a man camping by the roadside. From the description that had been furnished him by Mr. Ingham, the constable arrested the fellow, and on bringing him back to the police station he was fully identified. He was then locked up on a charge of wilfully and maliciously setting fire to the property. It was a fortunate circumstance that there was not any wind blowing at the time or the adjoining properties of Messrs. Heffernan, Cahill, Brown and others right down to the Clare Inn would probably have been destroyed. The accused was brought into Bendigo on Thursday by Constable Baydon and, during the afternoon. Mr. J. R. Hoskins, J.P., attended at the Town Hall and remanded the accused, who denied the charge, until Thursday next. At Mr. Drake’s Hall on Wednesday, 25th August, the annual concert was held in aid of the funds of St. Mary’s Church. The Rev. M. Heffernan occupied the chair. The attendance was very large and the programme good. The following ladies and gentlemen contributed items: — Misses M. Bentley, C. Ronan, V. O’Donneli, E. and M. O’Connor, and C. J. Drake, Messrs. W. Ruth, J. Herrick J. R. M cDonald, and A. Brown. Mrs. W. Ruth acted as accompanist, and her playing was a feature of the programme. The manner in which the artists rendered their respective items must have been pleasing to the party who travelled from Bendigo over bad roads to entertain the residents of Axedale. Mr. C. Burke, of Bendigo, with his usual generosity, placed his fine car at the disposal of the artists. He also contributed to the funds by raffling a clock which was won by Mr. R. O’Brien, of the Crown Hotel, Bendigo (ticket No. 39) Mr. W. Hawkins acted as secretary, and was ably assisted by a ladies committee, with, Misses D. Neylon and A Brown as joint secretaries. The Rev. chairman thanked all who assisted to make the concert such a social and financial success. On the last Friday of the recent school holidays, excited little pirates converged on Axedale Community Park for the Axedale Community Pirate Party. Organiser Sonya Browne said the event which was sponsored by Axedale Our Town Our Future was a huge success. Children had fun on the pirate jumping castle and were even able to walk the plank like a true pirate. 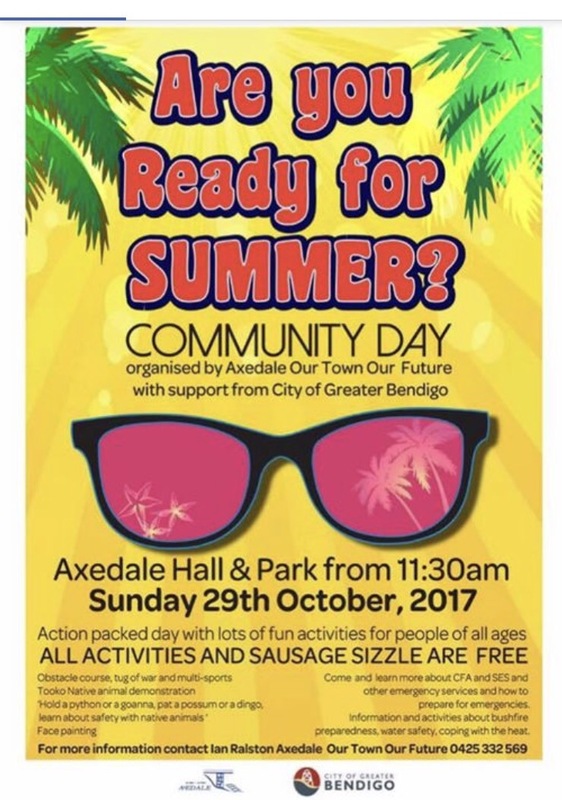 The Axedale Community is well know for their support of local events, and this one was no exception. This was a free event which was an added bonus for families at the end of the school holidays. Swooping along on a two mile front late in the afternoon of December 25, a terrific tornado caused extensive damage. The townships which suffered most were Knowsley, where not a building escaped damage, and Axedale. The storm passed Bendigo more than 15 miles to the south, and levelled many trees and much fencing. All railway and post office telegraph lines are down between Heathcote and Bendigo, Axedale being the furthest station which can be picked up. Reports stated that uprooted trees blocked the roadway and probably the railway line between Derrinal and Axedale. Gangs have been sent to inspect the railway line and restore the telegraph service. Bendigo hardly felt the blow. The tornado was one of the most severe experienced in the Bendigo district. So far, no word has been received of loss of life. The severest section of the storm was from the fringe of the Wellsford Forest across Axe Creek to Axedaie and then on to Longlea. The tornado had a width of two miles and took only about three minutes to pass over. It was followed by heavy rain averaging an inch. When the storm left the forest, it first struck the home of Mr William Hawkins 4 1/2 miles from Axedale, on the banks of Axe Creek. Most of the house was unroofed, and damage was done to the outbuildings and fencing About a mile nearer Axedale the homestead of Messrs. Hawkins Bros was also struck by the storm, and fiverooms of the seven roomed house were unroofed. Extensive damage was caused to the outbuildings. Similar damage was caused at other farms at Axedale. Mr D. Cochrane, who had been building a new home, had erected a large garage, workshop and shed. This and his house were badly twisted, and portions were blown away. Part of the house was lifted from its foundations. Between this place and the Axedale township, many trees were blown down, and the main Bendigo Road was blocked. The roof of an unococupied house was torn off. Mr J. Clyne’s house was damaged, and the properties of Messrs W. Weston, J. Ryan and W. S. Millington suffered. The roof of Mr H. Doyle’s house was lifted bodily and parts were scattered in all directions. A valuable trotting horse, the property of Mr John Brundle, became frightened and took shelter in a corner, where a tree fell on it. It was rescued unhurt. The storm next travelled to the Marydale Estate, owned by Mr F. Keighraan. The wool shed was wrecked and much fencing was destroyed. When the motor train from Wallan arrived in Bendigo 30 minutes late today, the staff reported that Knowsley had appeared to get the fury of the storm Not a single place in the old township remained Intact. The Roman Catholic Church, -a weatherboard building, and a private house were razed to the ground. The goods shed at the station and the the railway caretaker’s house were unroofed. The verandah and roof of May’s store were torn off and a motor garage in the town suffered badly. A progress association president says it is “now or never” for community action to keep an Axedale church from being sold into private hands. The St Paul’s Anglican Church congregation last met in 2015 and the Anglican Diocese of Bendigo wants it rezoned and sold. This Thursday the Axedale Our Town Our Future committee will consider stepping in to rally support to keep it in community hands. The church was build in 1913. In recent times the congregation had diminished until it consisted of just two families, the diocese’ general manager Naomi Fountain said. Two years ago the diocese and its Axedale Parish made the decision to stop services at the church, which Mrs Fountain described as “heartbreaking”. “We are very much a rural diocese (and) we work very hard in rural parishes to maintain a sense of community and ministry,” she said. Mrs Fountain said work had begun to rezone the property for residential use, though plans for a sales date was some time away. AOTOF president Jennifer Jones said the turnout at a recent public information session showed there was some interest within the community for the church to remain a public institution. She stressed any action to keep the building open to the public was still in early days, but could involve community groups purchasing it and surrounding land. It was unclear how much support any plan would have if it was taken to the wider community, though Mrs Fountain said once the property was on the market the diocese would be open to community groups’ interest. A community purchase would not come without what Ms Jones described as a “huge effort”. A community committee would most likely be needed to drive fundraisers, grant applications and other work needed to raise money and coordinate any campaign. Nor were there yet any concrete examples of what the building and grounds would be used for. “My personal opinion is that it could become a community house or a small community hub,” Ms Jones said. She said a recent survey had shown a need for space to house the area’s community groups. 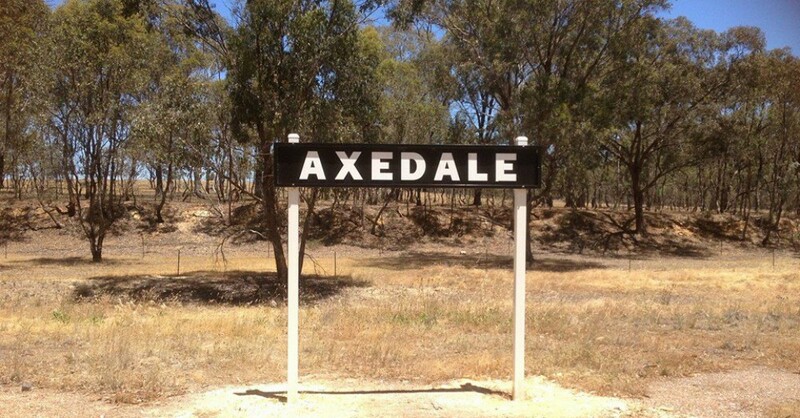 “Axedale is growing. There’s lots of young families coming here,” Ms Jones said.